COLUMNA MESSIANIC RESEARCH CENTER: Leadership & Governance 2: GOD AND THE WORLD NEED MESSIANIC LEADERS AND MANAGERS! Learn Messianic Leadership And Management Now, And Be Ready To Rule In The Soon-Coming Messianic Government of The King Messiah (Christ)! 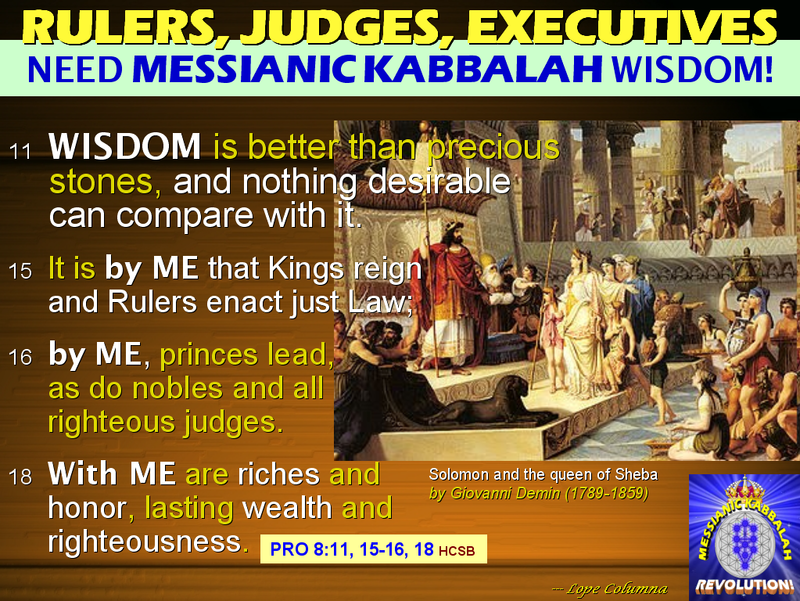 Leadership & Governance 2: GOD AND THE WORLD NEED MESSIANIC LEADERS AND MANAGERS! Learn Messianic Leadership And Management Now, And Be Ready To Rule In The Soon-Coming Messianic Government of The King Messiah (Christ)! Today, The Whole World desperately needs Illuminated Messianic Leaders and Managers to solve Climate Change Disasters and other Global Woes! Without these Messianic Leaders and Managers, Mankind will become extinct and Planet Earth totally destroyed! Also, God Himself needs these Messianic Leaders and Managers to be appointed as Kings and Priests during the 1,000-year reign of the King Messiah (Christ) of the Kingdom of God that will be established here on Earth very soon (Revelation 20:6). This End-Time generation suffers from countless man-made crises occurring simultaneously. Climate Change disasters. Polluted food, air, and water, Poverty, Heinous Crimes, Terrorism, Global Epidemics, Sexual immoralities/Perversions, Broken Marriage/Family Relationships, National Conflicts and Wars. All these happened and are happening because Mankind lost the Light and Godly principles of Leadership and Management. Today, Mankind desperately needs the Illuminated Messianic Leadership to guide him back to his Creator -- the source of Life, Peace, Prosperity, and all Blessings. Otherwise, Mankind will be extinct and Planet Earth destroyed! WHAT IS MESSIANIC LEADERSHIP AND MANAGEMENT? The philosophy and goal of Messianic Leadership and Management is to value Human Life and Beauty of Planet Earth; to the Glory and Honor of the Great Creator God. MESSIANIC LEADERSHIP teaches and guides Man how to properly leads himself and His fellow human beings. This Leadership enlightens and inspires people to do things that are aligned with the purpose of the Creator of Mankind, the Earth, and the Universe. This brings out the best in every human being. MESSIANIC MANAGEMENT teaches and guides Man how to properly use and manage the Earth's environment and resources. All of these Messianic objectives are according to God's Design, Purpose, and Principles of Life. In other words, Mankind will be taught how to connect to and tap his Creator -- the source of Life, Peace, Prosperity, Security, Safety, and all Blessings and Protection. And with the involvement of the Creator God, productive energies from Heaven above and the Earth below will bless and guarantee the success of all the efforts of Mankind. The world has lots of Leadership and Management Books, Seminars, Trainings, College Courses, Conferences, Summits, and Lectures. The problem with these worldly Leadership and Management Education is the lack of the Knowledge of God's Life Principles. Without the ILLUMINATING KNOWLEDGE of the Creator God, ALL THE LEADERSHIP COURSES BECAME MISLEADING, and ALL MANAGEMENT COURSES BECAME MISMANAGEMENT COURSES! The worsening Climate Change disasters, Wars, Terrorism, Heinous Crime, Pollution, Corruption, Immorality, etc., are undisputable proofs of these Mismanagement and Misleading Education (Romans 1:28-32)! Thus, for many centuries, the Godly Principles of Leadership and Management are not taught in Schools and Universities. As a result, the world is blanketed with thick darkness of ignorance, confusion, conflicts, destructive business competition, and "do it yourself" styles of Leadership and Management. So, now, we see and experienced its grievous accumulated result: Mankind and the whole Earth are in grave danger! Now, the End-Time has come for these Godly Leadership and Management principles to be taught; especially to God's People who will reign on Planet Earth with the King Messiah for 1,000 years (Revelation 20:6), and beyond. These Godly Leadership and Management principles will be implemented in the soon-coming Messianic Government that the King Messiah will establish here on Planet Earth. Examples of the Best Messianic Leaders in Man's History are mentioned in the Bible. These are the three Patriarchs (Abraham, Isaac, and Jacob-Israel), Joseph, Moses, Joshua, King David, Apostle Paul, etc. And of course, the ultimate Messianic Leader is Jesus Christ Himself -- the King Messiah, the KING of Kings, and the LORD of Lords of Mankind! How did these Great Leaders able to become Messianic Leaders? There is only one reason and cause: they were all imbued (more or less) with God the Father's MESSIANIC KABBALAH WISDOM! MESSIANIC LEADERSHIP IS WHAT THE WORLD NEEDS NOW! Today, Mankind desperately needs the Illuminated Messianic Leadership and Management to solve Climate Change disasters and other global woes! Without Messianic Leadership and Management, Mankind will be extinct and Planet Earth destroyed! Unfortunately, it is hard to find such Messianic Leaders today. This is because of the lack of God's Messianic Kabbalah Wisdom in all of the World's Systems: Religious System, Educational System, Business System, Government System, Scientific and Engineering Systems, Sports & Entertainment Systems, etc. Nevertheless, there are some World and National Leaders that were gifted with a certain degree of Messianic Leadership (although much less than the Biblical Leaders). In recent history, humanity witnessed and experienced the amazing works of spiritual and political leaders. Although they were secular and below the level of the Biblical great leaders, they showed us that kind of sterling leadership that has some quality of Messianic Leadership -- even the concern about the welfare of the POOR (Proverbs 29:7). You must not act unjustly when rendering judgment. DO NOT BE PARTIAL TO THE POOR OR GIVE PREFERENCE TO THE RICH; judge your neighbor fairly. So, we have Dr. Jose Rizal, Sir Winston Churchill, Benjamin Franklin, General Douglas Macarthur, President Abraham Lincoln, President John F. Kennedy, Mahatma Gandhi, Albert Einstein, President Manuel Quezon, President Manuel Roxas, President Ferdinand Marcos, President Joseph Estrada, President Rodrigo Duterte, etc. Our way of life has dramatically improved throughout the ages because of these brave men that have placed the wellness of their fellow man, especially the poor and the oppressed, at the forefront of their selfless leadership. But, sadly, they were taken away, and were replaced with humanistic Leaders that are non-Messianics, to the sufferings of people and destruction of the Earth (Proverbs 29:2)! 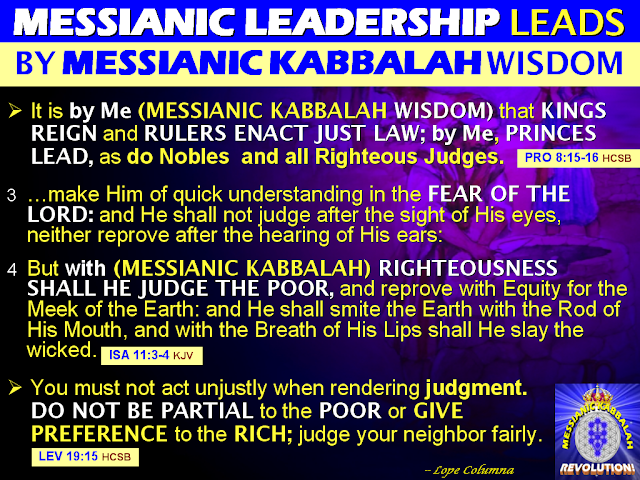 MESSIANIC-KABBALAH LEADERS AND PASTORS ARE NEEDED NOW! Many righteous Christians and Jews are now needed by GOD to be trained as MESSIANIC LEADERS under Christ to feed His people with the much-needed Messianic-Kabbalah Education (Jeremiah 3:15). Those who listen, study, and teach God's Messianic Kabbalah Wisdom are purified of their selfish ego. And their Evil Inclination is subdued or eliminated. They became overcomers, and they are made ready and prepared for the glorious return and Marriage Feast of Jesus Christ (Revelation 19:7). For more in-depth explanation about this vital subject, please go to: MESSIANIC KABBALAH PASTORS ARE THE TRUE MINISTERS OF CHRIST; PREACHING THE SECRETS & MYSTERIES OF THE TRUE GOSPEL OF THE KINGDOM OF GOD! Pastors, Priests, And Evangelists Who Do Not Know The Mysteries of God's Messianic Kabbalah Wisdom, Are Teaching The False Gospel of Men! HOW ABOUT YOU? WILL YOU ACCEPT THE MESSIANIC CHALLENGE AND BECOME A MESSIANIC LEADER? If yes, then join and support the BRIDE OF CHRIST MINISTRY OF LIFE and participate in the MESSIANIC KABBALAH REVOLUTION! Continued on LEADERSHIP, Part 3: WHY IS THERE VERY FEW OR NO GREAT MESSIANIC LEADERS IN THE WORLD TODAY? Because God Removes Righteous Messianic Leaders When People Sin and Depart from Him! NOTE: Bible verses used in this article is based on the Holman Christian Standard Bible (HCSB). If not, the other quoted translation is indicated. Mienne Chan and 4 others like this. bookmarrk yor blog ɑnd dеfinitely will comе back in tthe future.